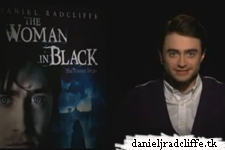 Do you remember my post about the promotion for the upcoming DVD/Blu-Ray release of The Woman in Black in the US. (22nd May) where you could send in questions to Daniel? yes? Did you send in your video message and you are now hoping that Daniel will answer your question...? Good news: The official WIB Facebook page has been updated with the first video. Congrats if your question got answered. Update: 10th May 2012. 2nd video added below. Update: 11th May 1012. 3rd video added. Update: 15th May 1012. 5th video added. Update: 16th May 1012. 6th video added. Update: 17th May 1012. 7th video added. Update: 18th May 1012.8th video added. Update: 19th May 1012.9th video added. 1st Were there any moments during filming that terrified you? Bericht door The Woman in Black. I am from the UK and i can't view these..:(..help please!..Thankyou. No? well that's odd, they work perfect to me actually, and I haven't heard more people about it..
that's odd.. , it's all I can say about it..